BE A LOCAL is a part of Hub Japan’s service to match local Japanese people and tourists from overseas. 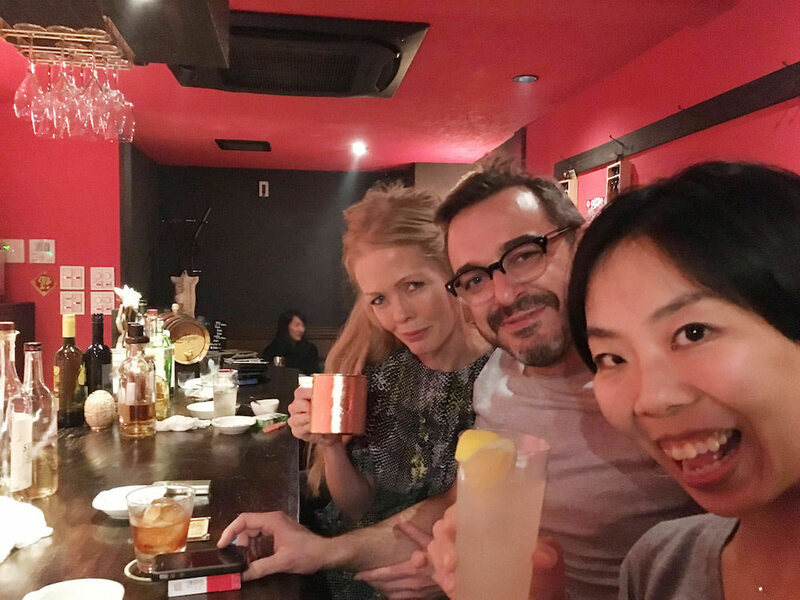 This is a report of the day local Japanese hosts took guests to a dinner in Tsukishima, an Okonomiyaki/Monjayaki restaurant, sashimi Izakaya, and a quiet bar. 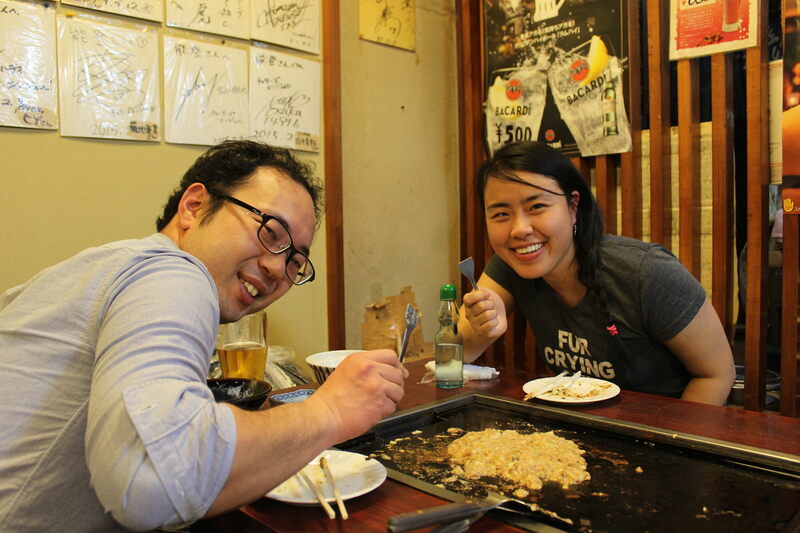 We received a request from a couple from Barcelona in Spain, Judi and Juan, to the plan to have Okonomiyaki/Monjayaki together in Tsukishima Monja Street and explore Izakaya without an English menu. Judi first gave us the message in September, two months before we actually meet. From the e-mails we exchanged in advance, we both knew that we work for similar domains. I was looking forward so much to meet them. Tsukishima is famous for Okonomiyaki/Monjayaki restaurants. There is a street called “Monja Street” where over 100 Monjayaki restaurants gather. 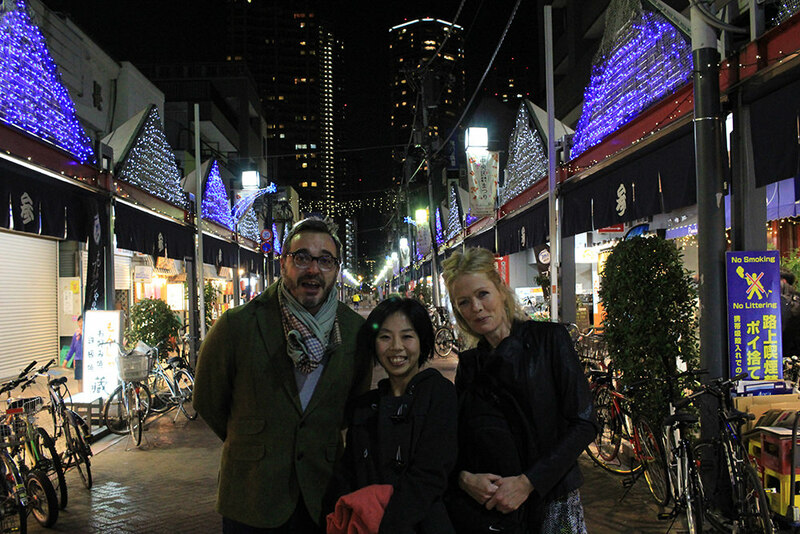 It was Judi and Juan’s first time to try the food; they said they like Monjayaki better. The restaurant was self-cooking style. Staffs deliver only bowls with ingredients and customers cook Okonomiyaki/Monjayaki by themselves at the iron plate on the tables. I showed how to cook each food. They seemed very interested! Then we changed the place to our favorite sashimi Izakaya in the area. The fish here are delivered directly from Tsukiji Market, so they are very fresh and cheap! Also, the atmosphere is very lively and very local. The place is always crowded with people work and live in the neighborhood. We were so lucky that we could get in! 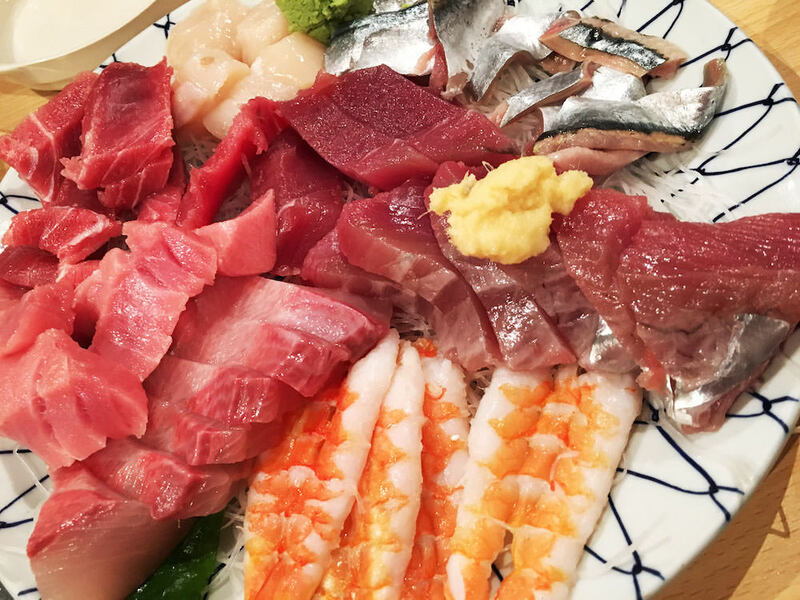 Sashimi platter looks amazing, isn’t it? As we discovered hopping places is pretty common both in Spain and Japan, we decided to go to another place to end the night. 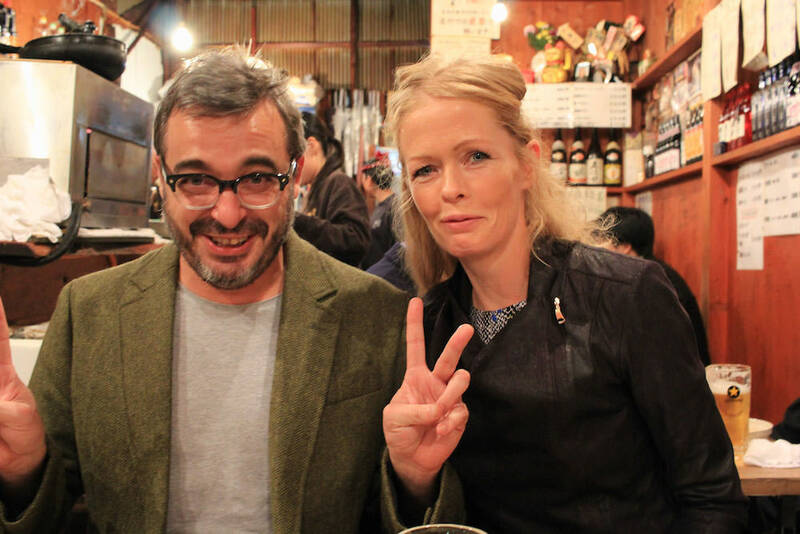 We found a nice looking bar near the Izakaya, so we went in. We each had two cocktails here. The bartender knew about cocktails and drinks very well. We had a nice conversation altogether, translating English to Japanese and Japanese to English. After the bar, we walked towards the station together and said goodbye. It was such a fun night to exchange about our culture and work styles, etc. We have had the most wonderful night with you both! 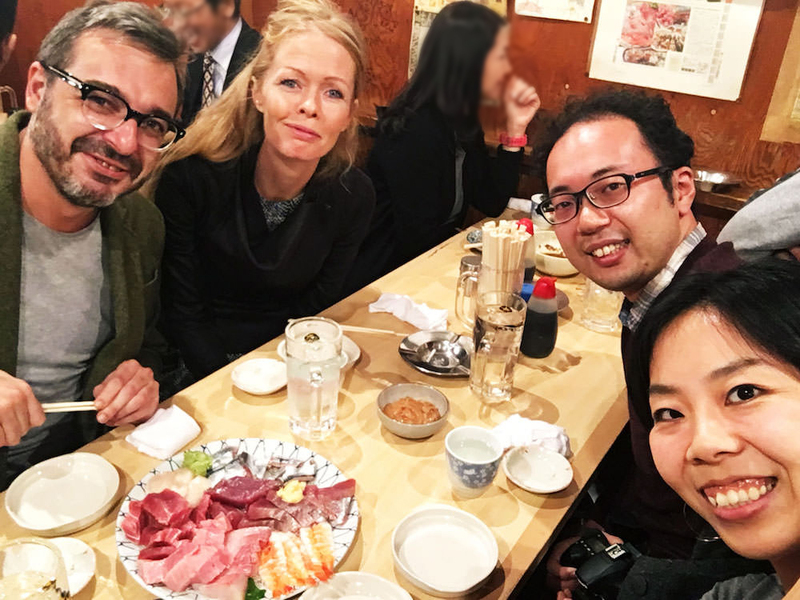 You gave us true insight into how Tokyo people live and enjoy their times and we are sure you are going to have a lot of success together in the future.